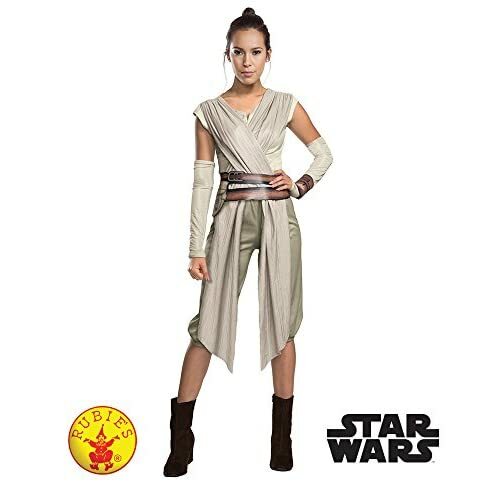 Star Wars continues the tradition of strong female characters with this Deluxe hero fighter Rey costume that includes deluxe top, pants, detached sleeves, cuff, and belt with pouch. The epic saga of the galaxy far, far away returns and you can join the fun! Officially licensed, The Force Awakens costumes and accessories for Captain Phasma, Rey, Kylo Ren, Flametroopers, and Stormtroopers were created by Rubie's Costume Company in partnership with LucasFilms. Offered in size Small (33 to 35-inch bust, 25 to 26-inch waist, approximately dress size 6 to 10), Medium (36 to 38-inch bust, 27 to 30-inch waist, approximately dress size 10 to 14), and Large (38 to 40-inch bust, 31 to 34-inch waist, approximately dress size 14 to 16). Sizes are approximate, most costumes are not designed to a clothing size standard; some adjustment may be needed. Rubie's is the world's costume leader and they take seriously the mission to make dressing up fun! Mascots, rental quality costumes, masks, wigs, accessories, and shoes can all be found under one of the Rubie's brand. Still family-owned and family-focused, Rubie's brings you fun for every season.